Mix all ingredients except food coloring. Stir over medium heat until smooth. Remove from pan and knead with food coloring until smooth and colors are even. Place in a plastic bag or airtight container when cooled. Bran Muffins - Watch Out...You Can't Eat Just One! This is another recipe given to me by my mother-in-law. These muffins are amazing! They make about 5 dozen so they're perfect if you have guests coming, you're hosting a get together, or having a meeting at your house. It's great because you mix them up the day before and just pull them out to bake! Grease muffin tins and fill 2/3 full. Bake at 400F for 20 minutes. Store in refrigerator up to 6 weeks. Progress Continues On University Village! We have been working nonstop the past few weeks trying to get some rooms at University Village ready to house some short-term teams and also so one of our staff couples could move in. It's been awesome to see change take place! As I've worked out there painting and cleaning and painting and cleaning some more, I get excited knowing that soon the place will be filled with students getting discipled and trained in construction skills, computers, hospitality, and so on. I've also had the privilege of decorating the rooms. I love finding good, cool stuff on a cheap budget! I decided to go with the animal/earth tone theme since we are so close to Kruger Park. It's turned out nicely. I so enjoy making a place feel like a home and practicing hospitality. My goal is always, when someone walks into a house or a room, they would sense a warm, cozy, peaceful feeling. We still have lots more work and decorating to do but I think we're off to a good start. TJ, one of our staff member's teenage son, walked into the house the other day and said, "This place looks like a hotel!" Thanks, TJ! Have any of you ever watched The Office? 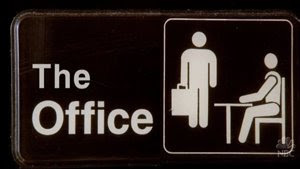 I must say, despite Steve Carrell's uncomfortable humor, it's one of my favorite shows. We just finished watching Season 3 on DVD (thanks Mom!). Some of it's priceless! Like Jim coming to work dressed up as Dwight. Or when Jim puts Andy's cell phone in the ceiling and then keeps calling it. But let's not forget the episode "Women's Appreciation!" I mean how funny can you get! We are anxiously awaiting Season 4 to come on DVD so we can continue the hilarious laughs! If you've never watched it and you're in the mood to laugh, I highly recommend it! The kids have been battling a cold the past few days, so at night, sometimes they have trouble sleeping. The other night Emma Grace was tossing and turning, crying, and just really uncomfortable. I went in to her room, picked her up into my arms, and sat down on her bed. I looked down and noticed that, despite her eyes being closed, she was smiling. I thought about how she must have felt safe in my arms and totally at peace. It was such a sweet moment. I then started thinking about the children living in the communities here. I suddenly felt emotion as I thought of the many 3 year old girls living without their mommies and daddies. How they must long to know what it feels like to be safe in their mother's arms or even to feel safe at all. Can you imagine your child growing up without feeling that sense of security? The kids have really been missing their grandparents lately. They keep asking, "When are we going to see Grandma and Grandpa? When are we going to Pops and Hannah's house?" They've been reliving memories they have. I'm really glad that even though we have never lived near the grandparents, the kids know them and miss them and want to see them. Joshua's excitement when he realized the books were about the same Horton he had seen in the movie! The day before the craft, paint the wooden clothespins black with an acrylic paint. Cut small pieces of pipe cleaners and fold them into a "V." Use a hot glue gun to glue them to the top of the clothespins. Spray the coffee filters (we couldn't find round coffee filters at our local grocery store so I cut pieces of crepe paper into circles) with water. Let the kids paint the coffee filters. The water will make the colors bleed. Let the "wings" dry. After they are dry "crunch" them in the middle and slip it into the hole of the clothespin. You can even attach a magnet to the back and display on the fridge. Breaking The Wishbone Brings Back Memories! My mom would always save the wishbone from the chicken for my brother and I to break. You know, you make a wish, pull your side, and whoever gets the top part, their wish is supposed to come true. Kind of silly but fun nonetheless. I started saving the wishbone for my kids. They have fun with it. Although Joshua is usually pretty upset if he doesn't get the top part. He's a lot like me. He plays to win! While Emma Grace could really care less. Well, this time she won. Does anyone else think of Dustin Hoffman in the movie Meet The Fockers when you hear the word chimichanga? I was looking through my Southern Living All The Recipes From 1993 cookbook the other day when I came across this recipe for chimichangas. I was so excited. There are NO Mexican restaurants here in our area and we long for the tasty cuisine that we are so familiar with. So we had a mexican night complete with chimichangas, bean salsa, and tortilla chips (which you can find at only one store here). It was great! And it tastes great topped with sour cream or guacamole (I have an incredible advantage - we have an avocado tree in our backyard!) Here's the recipe I used. It was really simple! Combine first 5 ingredients in a large saucepan; stir in 2/3 cup salsa. Cook over medium heat 5 minutes, stirring often. Spoon about 2 tablespoons of chicken mixture just below center of each tortilla; sprinkle tortillas evenly with half of cheese. Fold left and right sides of tortilla to partially enclose filling. Fold up top and bottom edges of tortilla (making a square). Place folded side down in a lightly greased 13 X 9 X 2 inch baking dish, coated with cooking spray. Repeat procedure with remaining tortillas. Bake at 475F for 13 minutes. Heat remaining salsa in a small saucepan; pour over tortillas, and sprinkle evenly with remaining cheese. Makes 8 servings. I don't know about yours, but my kids love baking and "helping" in the kitchen. It is fun and something interactive and I like that they want to help. (Joshua is now an expert at grating cheese!) And they love to tell daddy what they made when he gets home. We tried out this new recipe for Banana Chocolate Chip Muffins from Family Fun. I thought they turned out pretty tasty. Chocolate chips are a wanted commodity around here (they taste better in the states so we usually try to stock up) but I think they were worth using in this recipe. Here's a sampling of how it went. There's A Fire On The Mountain! We've played many games with the kids including the traditional ones of Duck, Duck, Goose; Red Light, Green Light; London Bridge. But their all-time favorite is definitely Fire On The Mountain! This week we celebrated 3 birthdays of people on staff with us. It made me remember why I love birthdays so much. I always plan a big party for my husband and kids and try to make a special cake. Sometimes I feel I go a little crazy but I LOVE celebrating birthdays. It honors the person and it's a day to celebrate their life. Isn't that reason enough to make a big ado about their birthday? I think so! And I admit I like planning a party and then seeing it come together. Here's the birthdays we celebrated this week. When Joshua watches a movie, he loves to get out his art kit and a piece of paper and draw the characters from the movie. He's done Toy Story, Monsters Inc., Shrek, and his newest creation, Bee Movie! I think it could be the new Bee Movie poster! What do you think? If you like pasta, you have to try this easy pasta dish. And the tomato mixture is perfect for homemade bruschetta. In a large pot of boiling salted water cook the penne according to package directions until al dente, about 13 minutes. Meanwhile, in a large skillet, heat the olive oil over medium heat. Add the garlic and cook, stirring, until just golden, about 1 minute. Add the cherry tomatoes, oregano, crushed red pepper, 1/2 teaspoon salt, and 1/4 teaspoon pepper. Reduce the heat to low and cook, stirring, until tomato juices run, about 3 minutes. Add the penne, olives, parsley, and 1/4 cup Parmesan cheese to the skillet (or bowl) and toss to combine. Serve with more cheese if desired. The kids got haircuts over the weekend. Here's some pics of them posing with their new do's! Make Your Own Bath Paints! It creates endless hours of fun in the tub! Their goal was to paint the whole bathtub! They gave up after a while and dumped it all in the bathtub which made a huge bubble bath! Joshua gave himself a beard and Emma Grace started making "recipes." I think they had more fun doing that than painting! For detailed instructions, visit Family Fun. I Admit It...I Do Online Surveys! My husband laughs at me because I do online surveys. I just love free stuff and I love being able to do something so simple and get compensation for it. I belong to 3 different groups, MySurvey, E-Rewards, and American Consumer Opinion. Each one has different types of compensation. Every time you take a survey on MySurvey, you get points. You can redeem the points for gift cards to different places, small appliances, cookware, and more. You must reach 1000 points before you can redeem for any prizes. If you want to join, please see the MySurvey icon on the right of our blog page or click here. With E-Rewards, you get dollar points which you can redeem for airmiles on popular airlines as well as gift cards to Target, Starbucks, and Macy's. You can also get magazine subscriptions and much more. At American Consumer Opinion, you don't get points but instead, if you are selected, you can get checks in the mail for completing certain surveys. Sometimes it's not much but it's fun nonetheless. These are just a few that I've used for a few years now and have been happy with. I've received compensation from every one of these panels. It's been fun to give my opinion as well as try out new products. If you're like me, and you like free stuff, it's worth a try! Work Begins On University Village! Thank God For J&M Security! Celebrating The 4th An Ocean Away! Fun Craft To Beat The Boredom Blues!